Cross-Platform Support: It is known to work with Wine but with a few error dialogs appearing here and there. It retains functionality, nonetheless. - Can now open already-existing goomod files and edit them. - Pressing "New" in the file menu will no longer present a fatal error. - The "Save" screen no longer sticks around after finishing; less confusing. 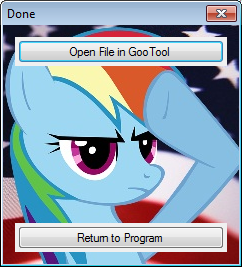 - Now presents the option to load in GooTool after finalizing. Good. But still lots to work on. Add more features and make the UI better. Are you using .NET Framework? I'm not sure what version you are version. But you should let the user know they must install .NET Framework first. P.S. Why doesn't goofans publish my add-in? I requested it to be published for half a month. RedTheGreen said elsewhere that you need .NET 2.0 for this. But yeah, it would be a good idea to have that displayed on this page also. And I've been home with not-terribly-high-speed internet for half a month, so I'm not approving addins. I'm heading back this afternoon, though, so hopefully I'll get the levels in the queue published within the next week. Sorry for the delay. Yup. That's why I got James to publish this. You know where to find him. He's always on Skype. He was surprised after this is like my 5th time doing something like this and it actually works in GooTool. EDIT: I've re-uploaded. 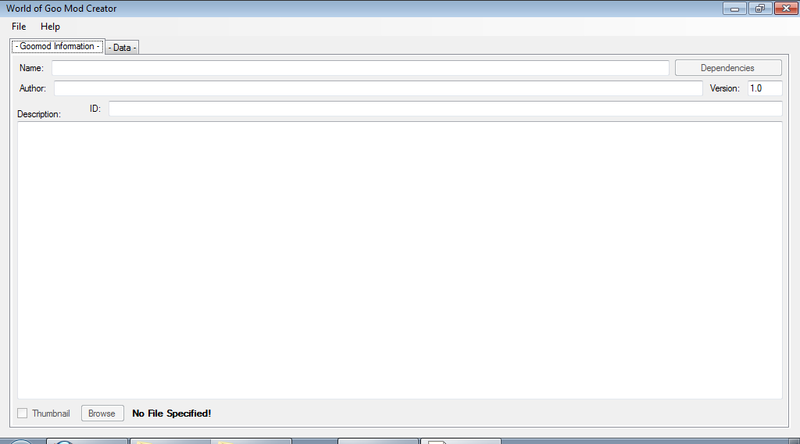 I fixed the fatal error when pressing "new" and it now prompts the user to load it in GooTool after. EDIT2: Oh... Thanks Pavke. I guess James didn't follow through. He tested it and everything, but I had to go. Crowded desktop you got there. Yay for Linux and multiple desktops. Yep, I'm not going to blame the netbook for the crowded desktop. Even if the screen is a little small. Try to replace 7za.exe with ZipOutputStream in .NET Framework. It will help you to make the program smaller. I don't know does this class contain in .NET Framework 2.0 but try it. @Mygod ZipOutputStream is a class in Java. This program was made in VB. Sorry. ZipOutputStream is a part of ICSharpCode. I think VB can use it too. VB can use that, but it's pretty much just as useful as 7za, except I've already set up 7za to work with this program. Sorry for not testing this before. It seems to work ok in Wine, the image near the top is broken, and it complains about an uncaught exception when it starts, but other than that, it may be ok.
What image? That's good. Have you tried opening a file? Also, copy the exception details and paste them in Skype or something where I can see what it says. Maybe I could fix it. Actually, I think it's the top menu image that's not displaying. I can still click on the menu items, but I kind of have to guess where to click, as I have a big red X rather than any menu buttons. It may or may not be Wine-specific, dunno. System.IO.DirectoryNotFoundException: Could not find a part of the path 'temp\imported.zip'. That's Wine-specific, as it doesn't happen in Windows. Maybe it's the backslashes? I'll look around and see if I can switch that out, but I think it should be fine with Wine.